In 2009, an elderly man in Wayne, PA was snowed-in during a winter storm around the holidays. Worried about his food supply, his granddaughter called the town’s local Trader Joe’s grocery store to inquire about having food delivered to his home. The employee at Trader Joe’s told the granddaughter that the store didn’t typically provide delivery services, but considering the conditions, they’d be happy to send someone to his home with groceries to get him through the storm. After reading off the long list of dietary-restricted items, the woman asked how she should pay for the order. The employee told her there was no need to pay, and ended the transaction with a friendly “Merry Christmas!” Thirty minutes after placing the call, Trader Joe’s employees delivered the requested items to the man’s home, along with other low-sodium items that paired well with several of the foods on the list. In refusing to let common, red-tape restrictions get in the way of catering to the customer’s individual needs, Trader Joe’s highlights one of the foundational building blocks for providing quality customer service: doing the right thing. The employee at Trader Joe’s, a perfect example of providing good customer service, demonstrated Caballero’s expert customer service advice. By doing the right thing, she was able to directly reflect company values by putting the customer’s needs first – regardless of procedural standards or regulations. Furthermore, by sharing her story on the Internet, the granddaughter sparked a wildfire of conversation between fellow Trader Joe’s customers who had similar experiences and also opened a dialog about the company’s superior customer service. As a business owner and management professional, you likely have a deep understanding of the importance of customer service and can see how this kind, customer-first act reflected Trader Joe’s in a positive light. However, in today’s cut-throat business industry, dialing in on how exactly to provide the best possible care can be difficult. But with advice from successful customer service professionals like Gene Caballero, you can gain the tools and resources you need to execute superior care for your clients. It’s not uncommon to overlook small details when looking at the big picture of providing excellent customer service. However, the small details make all the difference between businesses who provide merely good customer service and those who go above and beyond to cater to the wants and needs of clients. Making it easy for customers to contact you is one such aspect that gets frequently overlooked. The more lines of communication you can open with your clients, the more you’ll increase customer satisfaction levels and improve the overall customer experience. Monica Eaton-Cardone of Chargebacks911, a business that helps companies effectively manage chargebacks, says that providing quality customer service across all platforms isn’t just a change you should make for your client’s sake, but it also allows your company to capitalize on any and every opportunity to provide better care. Chloë Thomas elaborates further on the topic. Thomas is the creator of eCommerce MasterPlan, a three-part strategy that helps eCommerce companies plan, develop, and grow. The author, speaker, podcast host and customer service expert uses her success and experience to offer beneficial advice. “Great customer service now requires you to service multiple contact channels. You need different customer service reps for different channels – the rep who’s awesome on the phone, keep them on the phone! Then find the rep who loves juggling multiple social media conversations at once,” Thomas said. As a business owner, you’ve had plenty of experience fine-tuning reactive customer service initiatives like money-back guarantees, cost-free replacements, etc. And while being able to effectively react to customer’s wants and needs is still necessary, experts advise that it’s now more important than ever to be proactive. In today’s hyper-connected economy, consumers now expect companies to deliver proactive services based on real-time data. In fact, Enkata Technologies found that companies who offer pre-emptive services reduced their call volumes by more than 30% and increased customer retention rates by three to five percent. As the President of SJS Solutions, LLC., a consulting group that provides contact and call centers with effective solutions for improving customer service, Scott Sachs knows just what it means for companies to take a proactive approach to customer service. One of the most reliable ways your company can make the seamless shift into providing superior proactive customer service is to request feedback from your customers. Give them countless opportunities to offer advice on ways to improve your products or services. By thinking one step ahead of your clients and frequently requesting their feedback, your company can do more than boost trust and loyalty in your brand. You can monitor trends in customer wants and needs, get inside the minds of your most valued resource, and provide superior customer service in an effective and proactive manner. Thank you for giving us the chance to work on your car. I truly appreciate your business and I hope you were satisfied with the level of service we provided. Please don’t hesitate to call on us again. The story was posted on Reddit and triggered a conversation of nearly 800 comments, most of which highlighted the gratitude customers feel when they are personally contacted by a business. More often than not, it’s easy for companies and management leaders to get caught up in the transactional nature of most modern sales models. However, by shifting your focus to customers as real-time relationships rather than standard transactions, you can stand out to customers as a brand that honestly cares about them as people and not just a number. “It is imperative that your customers know they are dealing with a real person, not an automated answer machine or an auto-response email; use your name when you pick up the phone, address the customer by their name during phone conversations and via email,” said Jenny O’Brian of Poles Direct. 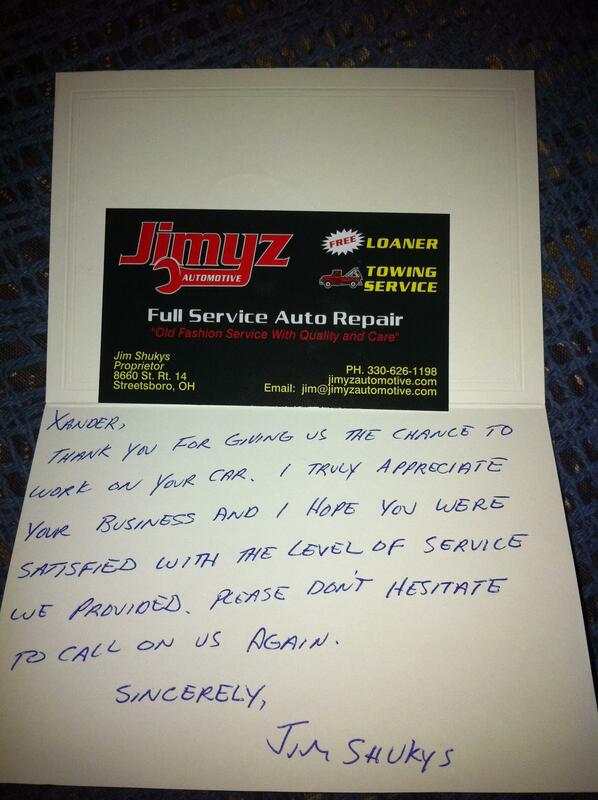 While Jimyz Automotive elected hand-written letters as a means of personal communication, there are simple changes your company can make to ensure your customers are being treated with the respect they desire and the individualized care that will keep them loyal to your brand. Whether you’re a startup company working through growing pains or a nation-wide organization aiming to boost customer retention, using simple tactics to remind clients that their business is important to you will cultivate a customer-centric culture that sets you apart. Andrew Hart, Head of Content at FM Outsource says that even if your company currently strives to provide personalized customer service, you should always be looking for ways to improve and adjust to the shifting business landscape. Don’t shy away from taking your own advice. Frequently ask yourself “what would make me feel personally valued by my company?” If you’ve already implemented using friendly, personal phone greetings, consider sending hand-written letters. If you currently have success writing letters, develop creative, intimate ways you can reach out to individual clients via social media. In today’s competitive business industry, superior customer service is what makes successful companies stand out. Bad customer service can completely kill a company. A recent study by the American Express Global Customer Service Barometer found that nearly 61% of American consumers think good customer service is more important amid economic instability and are willing to spend an average of 9% more at a company that provides it. Similarly, 81% of consumers say they are more likely to become loyal customers to a company who provides superior customer service, and 75% say providing quality care motivates them to share their experience with family and friends. So how do you execute flawless customer service according to the experts? By making it super easy for customers to communicate with you. By being proactive and anticipating your clients’ wants and needs. And by going out of your way to make sure your customers feel individually valued. Implementing these good customer service skills will help your company grow and thrive. These are the three keys to positive customer interactions at all levels of your company. Contact ROI Call Center Solutions today to begin your path toward providing excellent customer service.